Bangkok is known for historic sites, shopping, nightlife, spas, and museums. 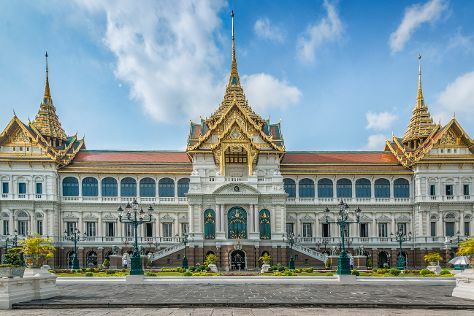 Your plan includes some of its best attractions: step into the grandiose world of The Grand Palace, indulge in some personalized pampering at some of the best spas, explore the ancient world of Wat Pho, and take in the spiritual surroundings of Temple of the Emerald Buddha (Wat Phra Kaew). To find maps, photos, and more tourist information, you can read our Bangkok trip itinerary builder . San Francisco, USA to Bangkok is an approximately 19-hour flight. You can also do a combination of flight and bus; or do a combination of train and flight. You'll lose 15 hours traveling from San Francisco to Bangkok due to the time zone difference. Expect warmer temperatures when traveling from San Francisco in June; daily highs in Bangkok reach 93°F and lows reach 79°F. Wrap up your sightseeing on the 29th (Sat) to allow time to travel back home.